Time Machine backups can be encrypted right from your Mac. This means the backed up data is extremely safe from prying eyes and the very unlikely event of a cracking attempt, and it also means you’ll need a password to access the encrypted backups yourself. 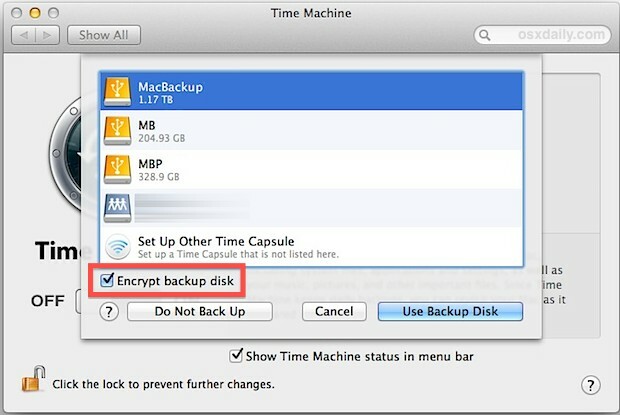 Enabling encrypted backups in Time Machine for Mac OS X can be done in two ways, either during setup of Time Machine, or turned on at a later date if you decide you want to encrypt other backups. We’ll cover both. The wording varies slightly depending on which version of OS X you’re using. You will need a modern version of OS X to have encryption as an available option to Time machine. This includes OS X El Capitan, OS X Yosemite, OS X Mavericks, OS X Mountain Lion, or newer to have the backup encryption option available, note the ability to encrypt existing drives only comes with newer versions of Mac OS X, though older versions of OS X will continue to have Time Machine backup support sans encryption. Certain folders can be excluded from backups if they don’t need to be encrypted, but because they won’t be backed up you’ll need to handle backups of those files manually. For those who don’t need to encrypt all backed up data, another excellent option is to encrypt folders with password-protected Disk Images. That disk image file can then be backed up as usual to a Time Machine drive, but only the data stored inside of it will be protected instead. Try as I might, I am on 10.8.2, and I can’t see any option to encrypt my existing Time Machine backup. :\ Any suggestions as to why this might be? I was finally able enable encryption on an existing time machine disk by first removing it from the time machine preference pane. When I added it back the optino to encrypt was there. will you be posting any new articles for mac osx ever or was september the last article? Issue with caching, there are tons of recent OS X articles!